Is it a fresh-chopped field salad, or a field-fresh chopped salad? Syntactic ambiguity strikes again! A telling fact about myself, a fact that I’ve hidden up to this moment, is that I really love salads. I can quite happily munch on a salad every day of the week and go to bed happy – if, of course, it’s a good salad. There are, of course, very many bad salads in our world. Whether they be terrible over-priced salads that loom out at you from fast-food drive-thru menus, or a restaurant’s “house” salad that’s little more than iceberg lettuce with italian dressing on it, or even a pizzeria salads. However, because of the miraculous age we live in, a futuristic age of reality-bending technology and hyper-advanced demographic marketing, there are also incredible salads out there. Salads with globs of Gorgonzola and candied pecans and poppy seed dressing and more calories than an entire pizza. If god truly loved us, I would be able to eat salads like this daily and not have to worry about my arteries bursting like sausages, but as it stands I must daily endeavour to find a delicious salad that’s also healthy. 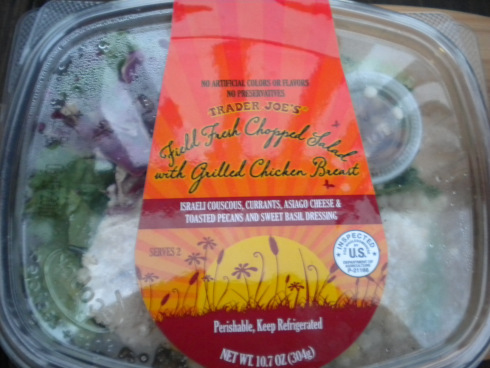 Ladies and gentlemen, Trader Joe’s won new space in my heart with their lovely Field Fresh Chopped Salad with Grilled Chicken for doing just a thing. Let’s get into it, shall we. A truly good salad takes seemingly incompatible elements and makes them work in a lovely fashion. Trader Joe’s manages this with, in addition to grilled chicken and lettuce leaves, couscous, currants, asiago cheese, pecans and a sweet basil dressing. The salad balances these sweet, salty, tangy and mild tastes into a satisfying equation of harmonic simplicity. In other words, a delicious eat. I will admit this is the first time I’ve ever eaten couscous and currants together, but the combination is flawless. In fact, not only is the salad delicious, it’s also tremendously unique. In a world where you see the same salad variations repeated endlessly on menus everywhere this is a breath of fresh air. Actually, it’s surprising that TJ’s decided to simply label this a “Chopped Salad” when so much more is going on. Although it fits the technical specifications of the genre, a vaguely Mediterranean salad that has been chopped, this one shows so much more ingenuity in ingredient choice that it deserves one of the more overwrought names TJ’s likes to hand out to it’s products. Other qualities that should not go un-touted: the package includes a perfectly proportioned amount of dressing for the quantity of salad, and comes along with the always useful packaged-in fork. Overall it’s the perfect item to take on a picnic, have for lunch at your desk, or compliment your dinner steak. 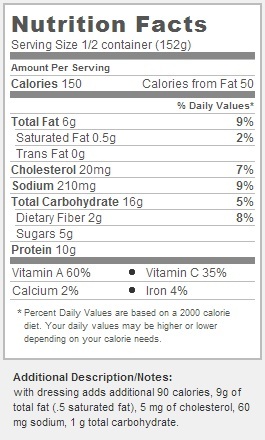 Would I Recommend It: If you like salads half as much as me, you’ll love this one. Would I Buy It Again: Without hesitation. Final Synopsis: A tasty, clever salad you’ll want to see more places. I absolutely loooooovwe this salad! I relocated from Fresno, CA to Shreveport, LA where there is no Trader Joes within 200 miles. IS THERE A WAY I CAN HAVE THESE SALADS SHIPPED TO ME. I CAN EAT THEM EVERY DAY OF THE WEEK FOR YEARS ON END! When will this recipe be on your websight?